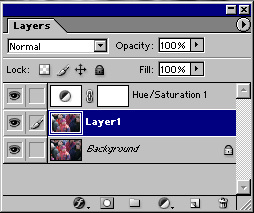 Having created one or more Adjustment Layer, it may not be convenient for it to cause changes to all the layers beneath. Photoshop will allow you to bind one or more Adjustment Layers to the required image layer by 'clipping' the Adjustment Layer to it. 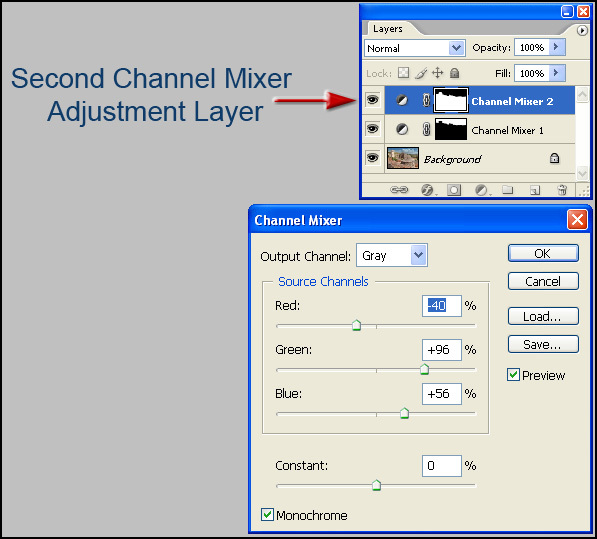 Create your Adjustment Layer and click 'OK'. When you see the 'Clipping Group' symbol appear (above), click (mouse) or press (Wacom pen) on the dividing line between the two layers line and the two adjustment layer thumbnails will displace to the right and a downward arrow will appear upon the layer, indicating that it is 'clipped' (associated) to the layer beneath. In earlier versions of Photoshop, the dividing line between the two layers changes from a solid line to a dotted line. Left: Clipping Group - the upper layer is 'clipped' to the lower. The two Layers now form a 'Clipping Group' and adjustments made will only affect the image layer to which it is 'clipped'. To 'unclip' the two layers, repeat the above procedure and they detach from one another.